The top photo is skin untreated with copper-peptides. the increased thickness of the skin. Hair researchers have noted the accumulation of this fat around healthy follicles that are vigorously growing hair, and its relative lack around dormant follicles, have postulated that these cells serve a supportive function for the hair follicle. The administration of copper-peptides increases hair follicle size and the rate of hair growth caused due to it's causing blood flow changes that provide adequate nutrients to the follicle, producing faster growing hair with thicker hair shafts. Copper ion complexed with certain peptides has both skin repair and hair growth enhancement effects. 1. Hair follicle before remodeling signaled by GHK-Cu(Copper Peptide). 2. The remodeling signal by GHK-Cu(Copper Peptide) increases the size of the hair follicles. 3. 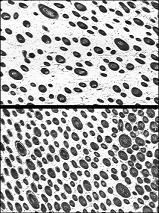 The enlarged hair follicle begins to produce new skin cells that migrate into the surrounding skin and rebuild the skin after usw of GHK-Cu(Copper Peptide). The photograph on the top is a microscopic field of hair follicles treated only with saline. 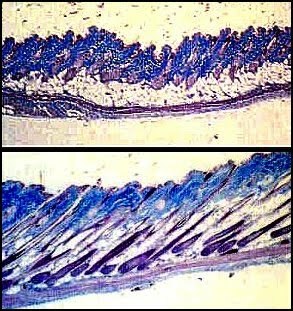 The photograph on the bottom is a similar area of skin treated with copper-peptides and which has a much higher density of hair follicles. Use of GHK-Cu analogs for hair follicle enlargement and stimulation of hair growth Methods for the design and testing of copper-peptide complexes with hair growth properties are described. Breakdown resistant, long acting copper-peptides used for stimulation of hair growth Tested copper complexed with protein peptones for hair growth effects in mice. Copper-peptide mixture produced more hair growth in mice than GHK-Cu analogs Pickart US Patent 5,554,375 Tissue protective and regenerative compositions.